It’s a win-win when RTN hosts an event at a game of our area’s local sports teams. 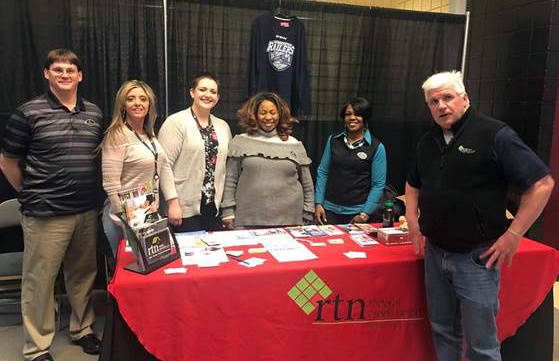 This past Saturday night, we hosted twenty-five guests and sponsored an information table at the Worcester Railers vs. Adirondack Thunder game at the DCU Center in Worcester, MA. It was great way to connect with contacts at our Select Employer Groups (SEGs) and community organizations while supporting the Worcester area and the Railers team. Attendees included representatives from RTN select employer groups (SEGs) and community organizations including Bedi Dental, UMass Cancer Walk & Run and Veterans Inc. The table was hosted by staff from the Credit Union and RTN Realty Advisors. The Railers are the ECHL affiliate of the New York Islanders.